Every semester, MGC is known for their MGC Showcase! 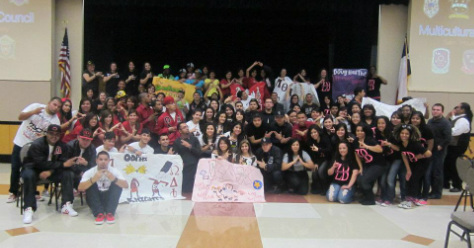 This Spring 2012 semester theme was MGC is All That and believe that MGC showed while presenting themselves in front of many interested students here at Sam Houston. Hosted by Joanne Iglesias (Sigma Kappa Omega) and Miguel Martinez ( Omega Delta Phi) and put together by our own Expansion Chair Krystina Christiansen (Sigma Kappa Omega), this showcase came out to be one of our best! I am excited to say that this Spring 2012 has a lot in store coming from all 7 active organizations plus 1 more organization trying to get colonized. Look out for all events planned out for this semester! Bigger and Better, We Are MGC! GO GREEK!!! Rainy weather didn't stop this sorority from putting on it's annual K-D-Kickball tournament last Saturday. The Zeta chapter of Kappa Delta Chi hosts a philanthropic event for anyone on campus to join and play for a great cause. "You create a team of eight to ten, pay $10 a person and then play kickball! It was a lot of fun!" says kickball team member. The winning team got proceeds of the event sent to their philanthropy of choice. Philanthropies represented included Wounded Warriors, Alzheimer's Association and Susan G Komen. While the students and families of Huntsville, TX enjoyed this event, it's not the only K-D-Kickball around. Other Kappa Delta Chi chapters host this event in their college town as well. "It's a great way to raise awareness and money. Even if your team doesn't win, you know that the money you pay to join is still going to a good cause." The sisters of Kappa Delta Chi couldn't have asked for a more successful turn-out and can't wait for next years kickball tournament. Kappa Delta Chi sorority, Inc. was founded at Texas Tech University in 1987 by four charter members. Since then their organization has grown to include 37 active chapters and 3 colonies around the U.S. Their philanthropy is the American Cancer Society and mascot is a penguin. To learn more visit http://www.kappadeltachi.org Good job ladies on yet another successful event! MGC Sorority Receives Highest GPA on Campus! Congratulations to our very own Sigma Kappa Omega sorority! In the Fall of 2010 it was announced that they held the highest overall GPA on campus. "Because we are such a new organization, it was really exciting that something this positive is what finally got our names out there! ", said junior Public Relations student Joanne Iglesias. Founded in 2001 on the campus of Stephen F. Austin State University, the group didn't come to Sam Houston State until March 2006. "This is a great way to spend our 5th birthday at Sam! And a new way to market ourselves to potentials," said Katie Lorton, sophomore Music Education major. The sisters strongly believe in one goal: to leave their mark on Sam Houston through setting an example of what sisterhood and service is. To keep up their GPA each active sister hosts a week of study hours in which each Pearl (prospective member) completes a minimum of two hours in the library. The sorority is very enthusiastic and looking for new ways to raise their GPA even higher and remain in the #1 spot! Their philanthropy is the Alzheimer's Association. Good job girls!